Action at the Academy Awards: Get Michael Moore to Run for President! Over the last 3 years the Green Party has witnessed some amazing growth. In 2002 alone we ran 545 candidates and won nearly 70 seats, and our candidates have received a greater and greater percentage of votes every year since 2000. We have two officials in State offices, John Eder in the Maine House of Representatives, and Matt Ahearn in the New Jersey General Assembly, and Matt Gonzalez is a quite prominent as President of the Board of Supervisors in San Francisco. Our party is the only growing party in the United States, while all the other parties have lost or remain unchanged in membership, the Green Party has grown by 27% in 2002 alone. In addition, corporate corruption, war for natural resources, and environmental disasters have brought the need for an alternative political voice to a head. We stand a chance to make a significant impact on the 2004 Presidential Election. But only, if we run a well-known candidate, with a serious message. After much contemplation, and discussion with fellow Green Party members, I have come to the conclusion that our only alternative to a Nader campaign is running Michael Moore for President. To get involved with this campaign visit our (preliminary) website at: http://www.cgmn.org/moore04/index.html and email mike at mike@michaelmoore.com to encourage him to run. We're putting together a moblization at the Academy Awards on Sunday Night, spread the word and tell folks to show up outside the Kodak Theatre at 4PM http://www.kodaktheatre.com/directions.asp . 1. Name Recognition: This is perhaps the most important reason to run Michael Moore. Without 70 percent name recognition it’s very difficult to run someone for President. Ralph Nader has 91 percent name recognition, people know who he is and are able to identify what he believes in. Think about George W. Bush, he started off his race sky high in opinion polls because people associated his name with his father. As people became more familiar with him, his popularity declined (actually they steadily declined throughout his whole race) but he was able to pull off a near tie vote because people associated his name with the Presidency. In the 2000 election people found out about the Green Party after reading about the Nader campaign, they didn’t find out about Nader from reading about the Green Party. Due to his recent movie and best-selling book, people know who Michael Moore is, and after he wins an Academy Award (more on this later) his fame is only due to increase. 2. He knows his Stuff:Michael Moore has dedicated his entire life to documenting and campaigning on issues related to social justice. He has written two best selling books, directed two amazing documentaries, produced two television shows, and made one satirical film all relating to the pitfalls of America society. Not only that, no one can accuse him of never holding a political office. When he was 18 he ran for the school board on a campaign of firing his former high school principal, and won! 3. People Relate to Him: Now, I think Ralph Nader is fantastic, and it was absolutely essential that he ran in 2002, however many of his detractors fault him for being a little aloof. I know the man is passionate, but no matter what he’s always going to play better to the college student/perennially leftist American elite, then he is to heartland America. Michael Moore on the other hand, its impossible to remove him from the heartland, the guy is the essence of Americana. 4. 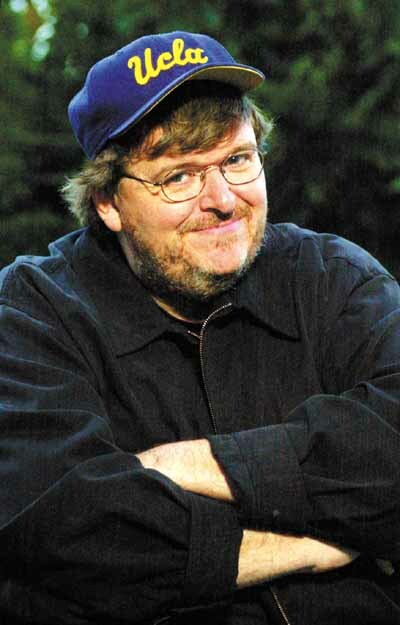 Media Attention: Michael Moore is a natural “media star,” a quality that Nader himself admits he lacks. He has after all spent the better part of his life creating media, so he obviously knows what plays well in front of a camera. And he accomplishes it without a trace, not a single wisp of phoniness. When Michael Moore speaks you know it’s unrehearsed and yet his statements are still immensely profound. 5. Familiarity: The public knows Michael Moore, he’s produced two TV Shows, The Awful Truth, and TV Nation, directed three great documentaries, Roger and Me, The Big One, and of course the award winning Bowling for Columbine. He’s also written three best selling books, Adventures in TV Nation, Downsize This! Random Threats from an Unarmed American, and Stupid White Men (#1 New York Times Bestseller List in its 46th Week). Not to mention his hit comedy Canadian Bacon. Even if some Americans disagree with him, everyone knows what he stands for, and that’s a lot more then an unknown candidate will bring to the stage. If we do run an unknown, half of our time will be spent trying to familiarize the public with this individual and convince them that they are credible enough to deserve their vote. So here is the task at hand. We must convince Michael that he should run for President, if at all possible we should try to convince him by March 23rd. Why March 23rd? It’s the night of the Academy Awards! Where it has been nearly unanimously decided that Michael Moore will win Best Documentary. If Michael takes this glorious opportunity, with millions of Americans listening to announce his campaign for Presidency under the Green Party, then we almost assuredly have 5 percent of the vote. Even if he doesn’t accept the nomination at the 2004 Nomination Convention, it doesn’t matter; his campaign will generate enough interest in the Green Party to be well worth it. Heck he can make a movie of the whole thing! It’s a golden opportunity to get the issues he sees as important out there, and to threaten the political power base enough for America to stand up and take notice.